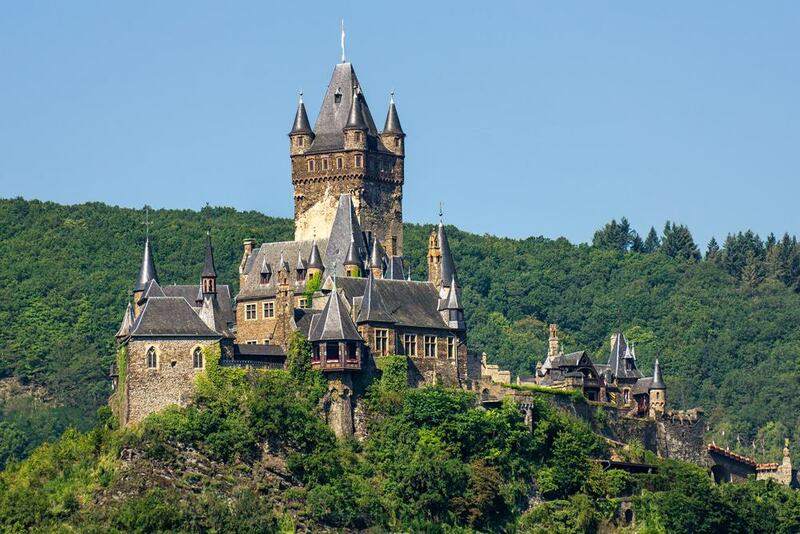 Cochem’s crowning glory is a Medieval toll castle, rebuilt in a fairytale style in the 1870s. 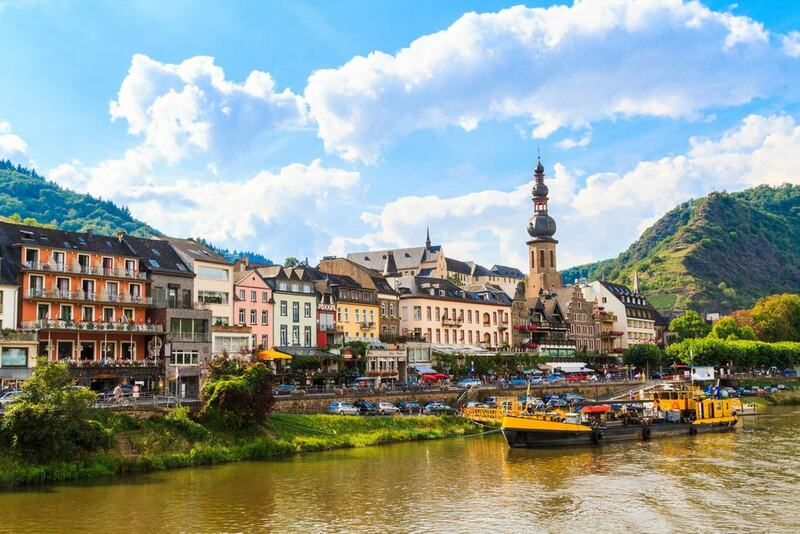 No matter which route you take into Cochem your gaze will be drawn to this fantasy-like sight and its giant four-storey octagonal tower far above the river. The castle goes back to the start of the 12th century. 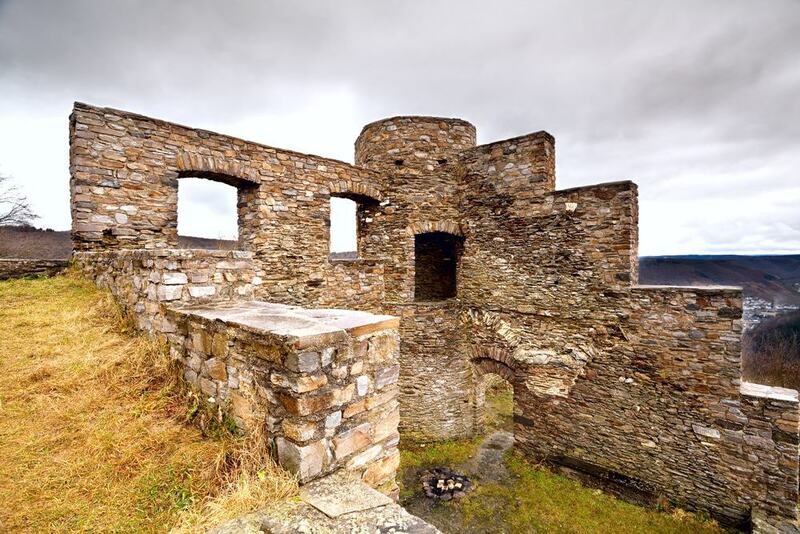 There are remnants of the Medieval building in the ring wall, octagonal tower, “Hexenturm” witch’s gate and the building housing the great hall (Rittersaal). But most of what we see today was done in the Neo-Renaissance style when the Berlin banker Louis Fréderic Jacques Ravené restored the property according to the Romantic tastes of the 19th century. A guided tour of the castle will take about 40 minutes, presenting tapestries, fine wood panelling, Louis XIV-style furniture, Baroque paintings, stained glass windows and armour. Pressed against the Moselle by the soaring valley walls, Cochem’s old town has undeniable charm. Tracing the sloped alleys are gabled, half-timbered houses, several storeys high and topped with Moselle slate tiles. The best ensemble of these is on Marktplatz, where the Baroque town hall from 1739 is sophisticated company for an alfresco meal. 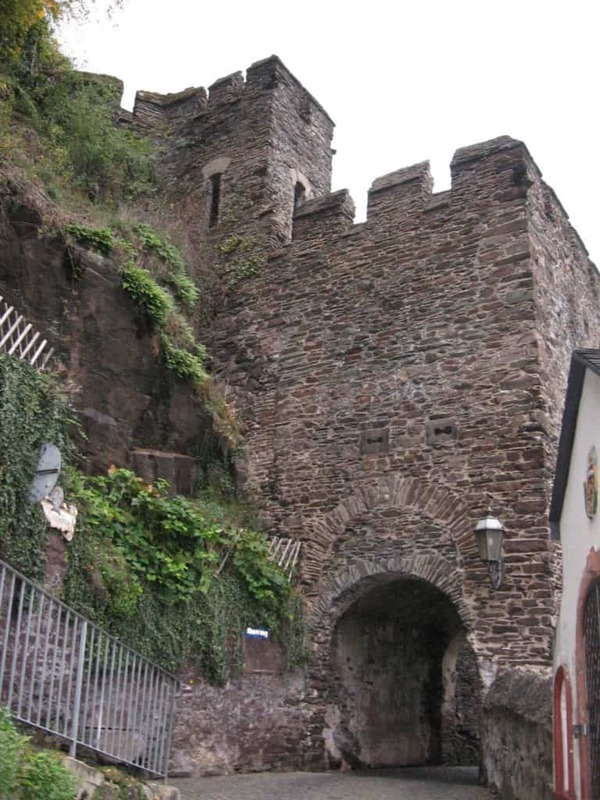 A lot of the city’s wall has survived, including three of four of the 14th-century gates, testifying to an eventful past when Cochem was an Imperial Estate. 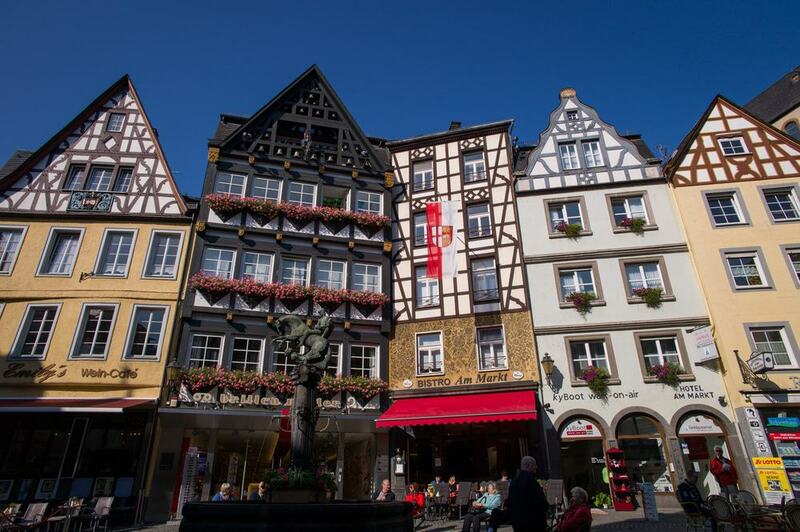 We’ll talk about a lot of the contents of the old town in this list, but do check out the mosaic of Cochem’s noble family tree on the bridge by the tourist office, and the Fuchsloch (fox hole), a tiny passage leading down to the Moselle promenade and the city’s smallest gate. Mid-March to November you can catch this gondola chairlift from the lower station in the Endert Valley up to the Pinnerkreuz lookout point. At 255 metres there are eye-popping views of the loop in the Moselle, the precipitous vine-covered valley walls and Cochem itself. The chairlift opened in 1955 and has a height difference of 155 metres. The steepest gradient is a dizzying 65%. 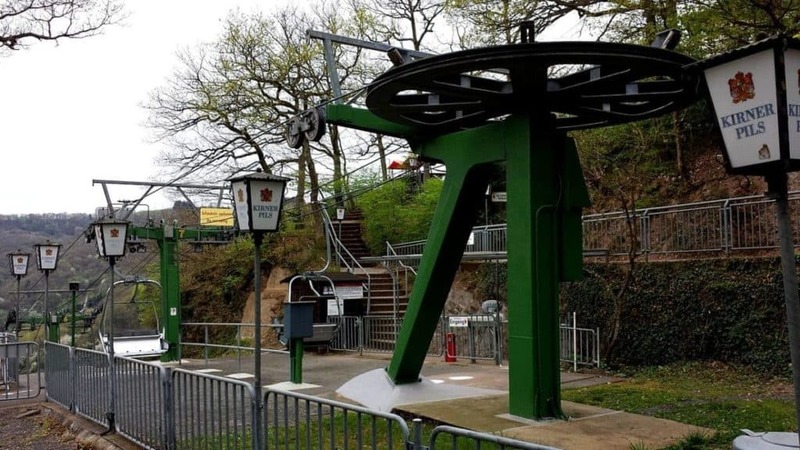 At the upper station a cafe with a terrace tempts you to spend a bit more time up here, or you can use the cable-car as the launch pad for a hike in the vineyards above the Moselle. In the Cold War the FRG was in special danger had a conflict broken out between NATO and the Warsaw Pact States. To avoid the hyperinflation that would come with a war the Germany Federal Bank set up secret currency reserves around the country. 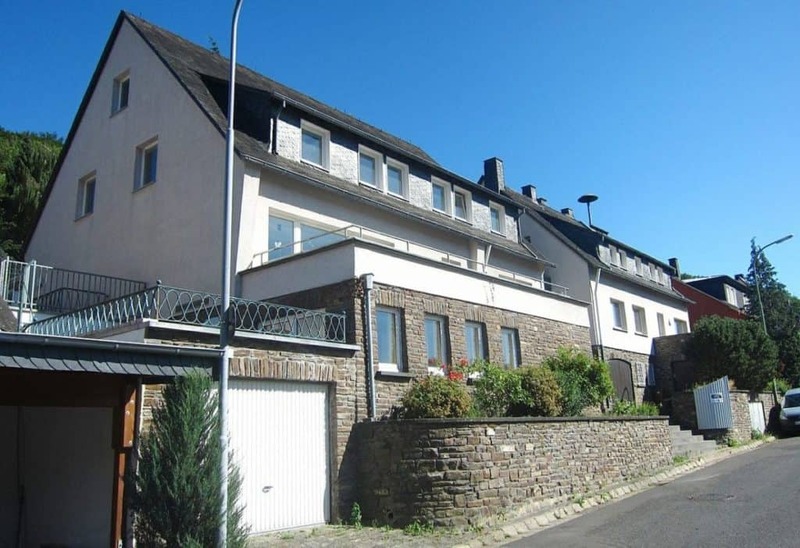 The one in Cochem is in a subterranean bunker and between 1964 and 1988 held up to 15 billion Deutschmarks. One of the coolest thing about the bunker is that it’s hidden in plain sight, and the entrance is disguised as a pair of nondescript residential houses. There are tours of the bunker taking you into the large safe where the notes were kept and telling how, with the help of a deep well, sand filtered air-supply and diesel generators, 100 people could survive for two weeks down here in the event of a nuclear war. 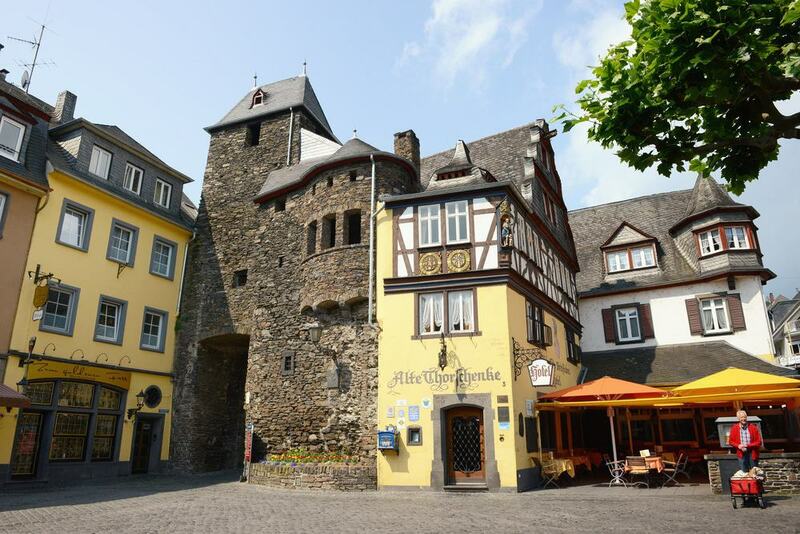 The largest of Cochem’s three Medieval city gates was built in 1332 at the northern entrance to the city. This tough-looking defence, with an a guard house attached, controlled the route into the city along the valley of the Endert, a left tributary of the Moselle. For hundreds of years the gate was a landmark for long-distance travellers riding stagecoaches through the region to Cologne or Frankfurt. As with many old gates, the Enderttor was Cochem’s city prison for a time and now adds lots of Medieval charm to a tour of the old town. There are restaurants and bars with outdoor seating right beside the gate. Five kilometres up the Moselle Valley in Ernst is a museum about culture in the Moselle Valley that opened just in 2017. The setting is a former hotel from 1959 and over four floors you can sample rural life in the Moselle Valley during the 50s and 60s. You can step into a reconstructed blacksmith’s forge, a schoolhouse with authentic furniture, a traditional wine tavern and a winery. There’s also a big cache of farming equipment, among which are 20 restored Fendt and Bautz brand tractors from the era, all perfectly maintained and in working order. Impossible to miss above the Endert Valley to the west of Cochem are the ruins of another castle, Winneburg, raised at the start of the 14th century. The castle is on a steep spur 80 metres above the river and was in the possession of the Lords of Winneburg until the line died out in the 17th century. In 1689 during the Nine Years’ War the castle was besieged, taken and blown up by the French Army, and has been untouched for the last 330 years. After a calorie-burning hike from the valley you can pick your way through the remnants of the outer bailey, ring walls, residential buildings and best of all the circular keep, 22 metres high and 8.5 metres wide. 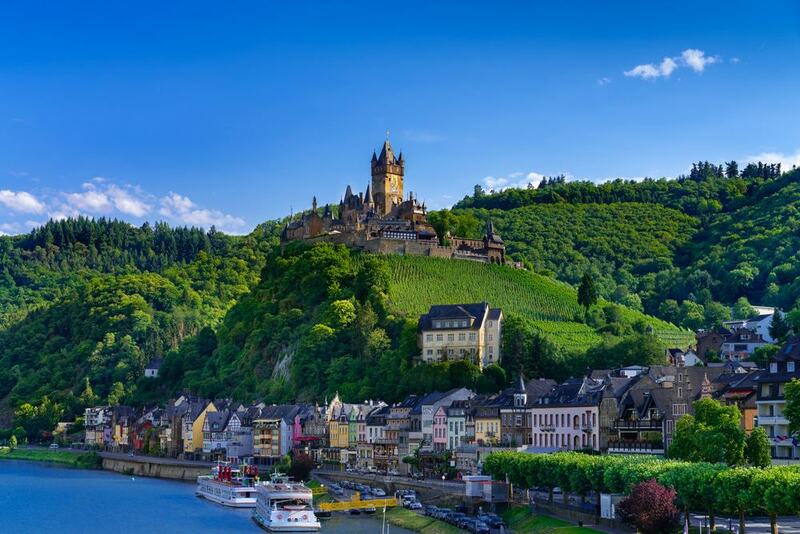 The Moselle Valley in Cochem is an amazing spectacle that deserves to be pondered from Cochem’s river banks. Next to the upper part of the old town the riverside walkway broadens into a park and just before the Skagerrak-Brücke (bridge), beside the quay for tour boats you can turn back for the ultimate view of Cochem Castle on its high roost. The bridge itself is another superb vantage point, while to the north on the left bank on the river the lawns are especially wide so you can take a picnic, gazing at the vineyards, slow river traffic and the high valley sides. 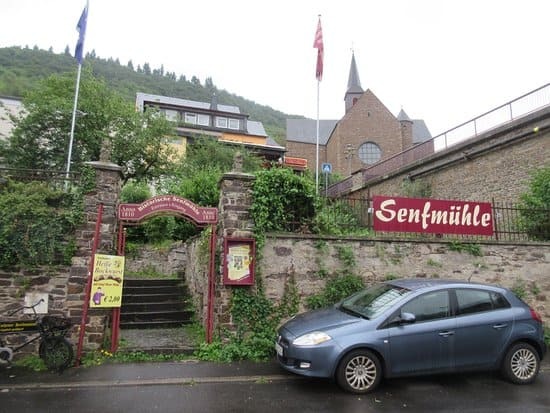 This mustard mill has been making Cochem’s favourite condiment since 1810, and seven days a week welcomes visitors on half-hour tours throughout the day. Under the guidance of the head mustard “miller” you’ll watch mustard being made using traditional skills, more than 200 years of savoir-faire and a recipe that has been passed down several generations. Best of all is getting to taste the many condiments produced here like honey mustard, Riesling infused mustard, curry mustard and a range of fruit preserves all infused with mustard. You can try the them alone, or order a bratwurst to bring out the aromatic flavour. The old southern entrance to Cochem is defended by the Martinstor, which came a little later than Enderttor, in 1352. In conjunction with the nearby Reichsburg, Martinstor was a toll gate, and a chain on the bank of the Moselle beside the gate would be used to stop ships to make sure they paid duties. Martinstor still has its Medieval battlements on two levels, and right after you depart Cochem through this gate you can start the climb to the castle. This serpentine path was plotted by Ravené when he rebuilt the castle in the 1870s. The Roman poet Ausonius waxed lyrical about the beauty of the meandering Moselle Valley in the 4th century, and you can walk the same path 1,600 years later. The Moselhöhenweg is a hiking trail with two arms, one on each side of the river from Trier to Koblenz. The trail is now more than 100 years old, and is waymarked with a white “M” on a green background. The route doesn’t always hug the river, as it takes little detours leading up to overwhelming viewpoints. If you’re really committed you could walk upriver to Alf in about six hours and then catch the train back to Cochem in just 10 minutes. 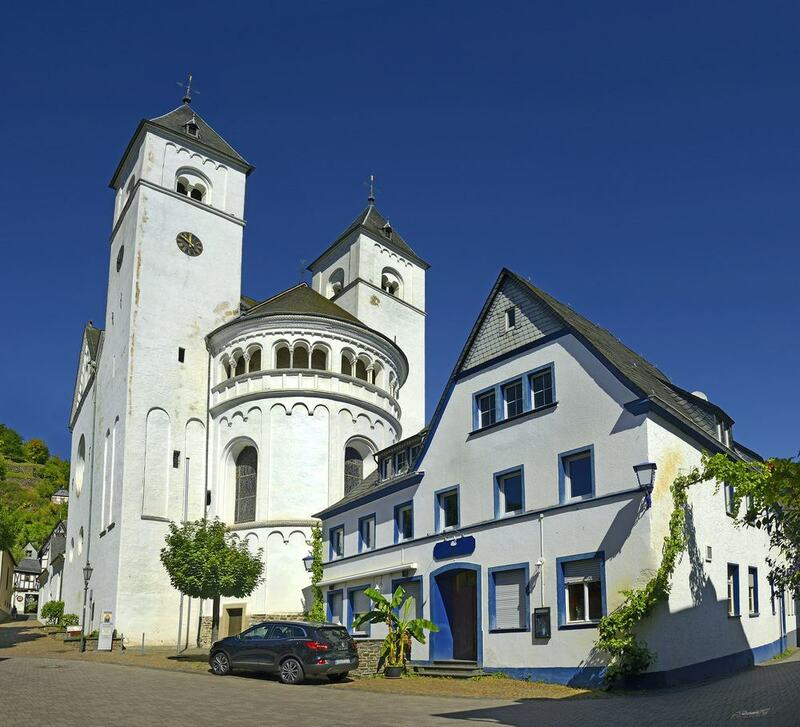 Minutes along the river in Karden is a Romanesque former collegiate church. St. Castor is the foremost religious building between Trier and Koblenz and is often referred to as the Moseldom (Moselle Cathedral). St.
Castor was founded as a basilica in the 8th or 9th century at the latest, and was then extended with a West Tower, Romanesque choir and nave in the 12th and 13th centuries. The must-sees inside are the Late-Gothic altarpiece from 1420, with an image of the Adoration of the Magi made from local clay, and the Baroque organ fitted by celebrated organ-maker Johann Michael Stumm in 1728. The vineyards in the valley above Cochem mostly grow Riesling grapes, and this white variety makes up about 60% of the Moselle wine region. The drainage on these steep slopes, the slate soils and long exposure to sunshine couldn’t be better for Riesling, which ripens late in the season and produces fruity wines with layers of flavour. 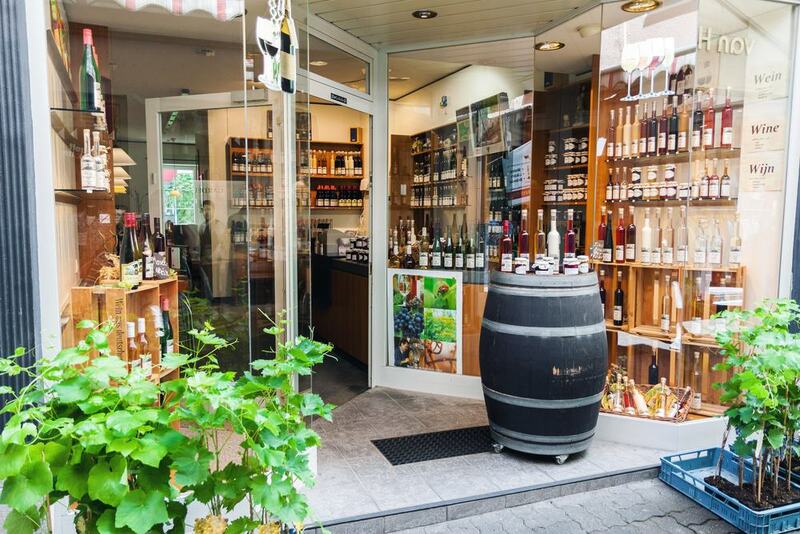 To get stuck into Cochem’s wine culture, try to be here late-May/early-June for the Cochem-Wein-Woche when 12 local vintners set up stalls on Endertplatz touting their Riesling and sekt sparkling wine. The whole affair is combined with live music, dancing and a fireworks display on the Friday evening. 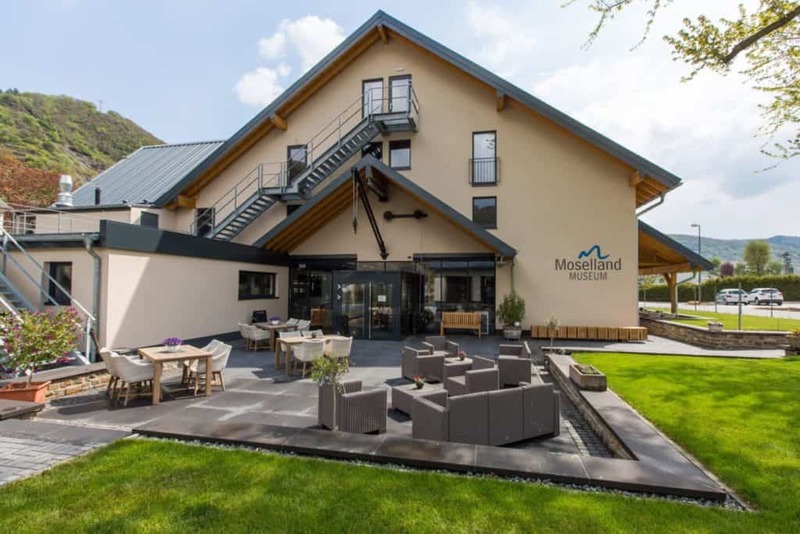 Chances are you’ll still have an appetite for the invigorating scenery in the Moselle Valley. 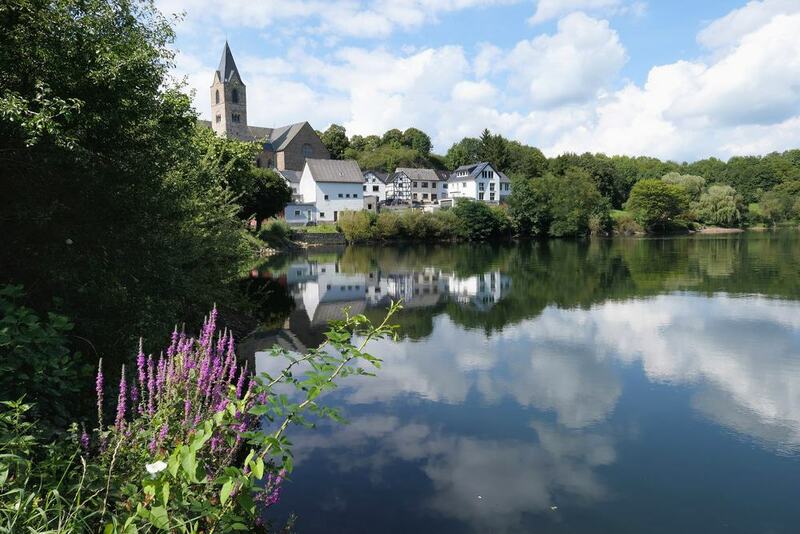 If so, make for the town of Ulmen to begin this 20-kilometre hike downhill through the southeastern Eifel region back to Cochem. The walk starts in heart-lifting fashion at the ruins of Ulmen Castle, above its namesake lake. From there you’ll journey though forest, past a seven-metre waterfall and down onto the Endert Valley. At one point the Endert powered 28 grain mills, and some of these have made it to the 21st century. Eventually the valley opens up, and you find yourself at the gates of Cochem once more. 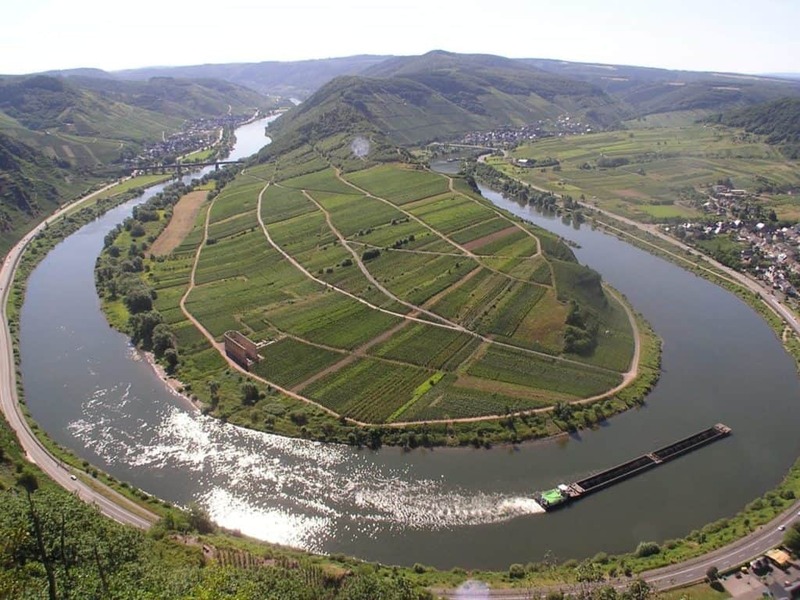 The Moselle is one of Europe’s busiest inland waterways and the second most travelled shipping route in Germany. Just sitting by the promenade you’ll be surprised by how many barges and cruise ships pass by, and you can join them on one of many cruises available from Cochem. The main cruise company on the Moselle is the family-run Gebrüder Kolb, operating 14 vessels. The largest of these is the Wappen von Cochem, which has a gigantic upper deck where you can watch the Moselle’s scenery scrolling past. If you want to go long-distance you can travel for a few hours upriver to Traben-Trarbach, or all day to Trier. Half the experience is seeing how the captain deftly negotiates the many locks along the route, while meals and Moselle valley wines are served aboard.